Children change everything. Winter used to mean Christmas (YAY!!!!) and Parties (YAY!!!) and fake holidays where everyone eats appetizers (Super Bowl!!! The Oscars!!!). After children, winter is that, AND a seemingly endless cycle of sick. It's better now that they are older, but still. December-March means cough, booger-nose, tummy troubles, fever, repeat. Small children tend to cough right into your mouth, without even trying! Whomp-whomp, everyone is sick. But don't worry. I have soup. Lazy soup. Lazy soup with things you might have lurking in your fridge and pantry. Also, its very low in Smart Points, 1 point for a giant, comforting bowl. Other sherries, especially the less expensive ones, have a certain, "Essence of Old Lady," thats not wanted, ever. Not that Fairbanks is particularly expensive. I think its around $7-$8 per bottle, and lasts me well over a year. 1. Add oil to 4 quart sauce pan and heat over medium high. Add onion and sauté until just beginning to brown, about 5 minutes. 2. Add garlic and sherry to pot, scraping up any brown bits. 3. Add both kinds of broth, lemons, parsley and turn heat to high. After broth begins to simmer, pour a bit in a bowl, cool it off and taste it. Add salt to taste. The amount of salt in my hand turned out to be 14 grams. 4. When mixture begins to boil, add in frozen peas and corn. 5. Bring back to a boil, then add chicken and kale. 6. Stir, turn heat to medium, and cook until chicken is warmed through, and kale begins to wilt. 7. Enjoy! Note, before storing or serving, REMOVE THE LEMON SLICES. You can leave them in if you like intensely, sour, bitter food. No judgements. Such a sad, tiny portion for SEVEN smart points. I knew one more recipe for overnight oats would do more good than harm. This recipe yields a hearty two cup serving, at four smart points per serving. Know a new mom? Make her some! Oats supposedly promote lactation. If I was making this for a new mom, I'd sub in whole milk or regular vanilla almond milk instead of unsweetened, and I'd add a swirl of honey and a sprinkle of nuts. New moms need those calories! 1. Drain and press tofu for at least 30 minutes. 2. Put drained tofu, vanilla extract and spices in a large mixing bowl and mash together with a fork until spices and extract are evenly distributed. Confession guys, I resisted the Instant Pot FOR YEARS. I had two Crock Pots, barely used, and a smattering of other small kitchen appliances of various levels necessity. Need? Want? You decide if you like standing around stirring the pot for a few hours, or would you rather give a few ingredients a quick sauté, AND THEN WALK AWAY, dinner ready in less than an hour? 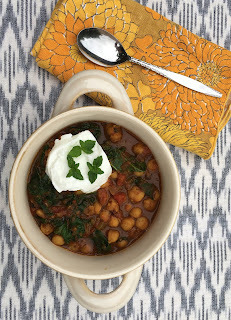 While I use my Instant Pot for a variety of bean dishes, this is consistently in the weekly rotation since a friend passed on this recipe from Carve Your Craving. I made a few tweaks to make this a little more Weight Watcher friendly, and fiddled with the spices a bit. My FAVORITE outcome after including this in our meal plan, is the dramatic reduction in our family visits to Tarka Indian Kitchen. My smart point budget thanks me, and yours will too. Pair this dish with this recipe for incredibly easy naan, and you'll never order takeout again.